Light Rail Excuse of the Week: Live Music! And now for something completely different. 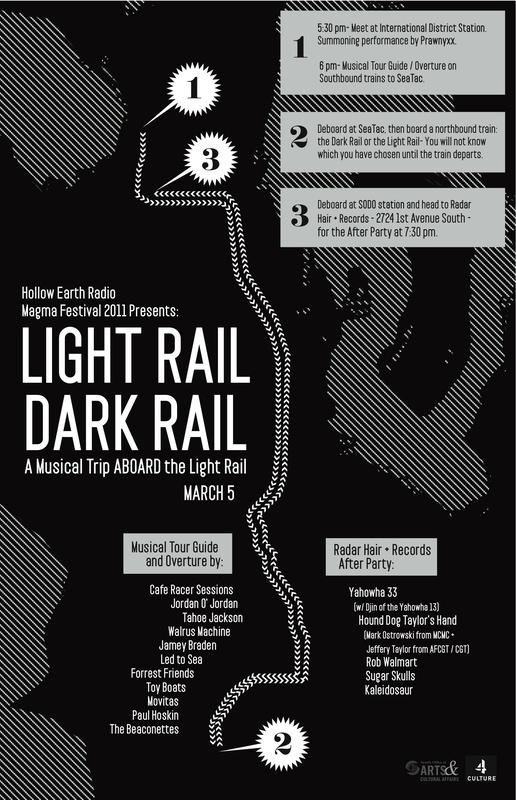 If you’re free tomorrow night from 5:30-7:30pm (or later for an afterparty), Hollow Earth Radio is sponsoring “Light Rail Dark Rail”, a series of live musical performances onboard Link. Performances start at IDS at 5:30, with “concertgoers” catching a southbound train at 6:00. Once at SeaTac, you’ll have a choice of northbound trains, “Light Rail” or “Dark Rail”, but you won’t know which you’ve chosen until it departs. Expect eclectic local music, nervous security guards, and surely dumbfounded passengers wondering what hit them. Considering that the rail operators have not seen any notes or anouncements about this event, is this a event sactioned by Sound Transit? It seems to be sanctioned by the City of Seattle Office of Arts & Cultural Affairs + King County’s 4Culture. Sound Transit is also aware of it judging from their Facebook page. I dunno, if I was just expecting a nice quiet ride home from the airport I think that might get pretty annoying. Maybe that’s just me. It’s not just you. It’s reasonable to expect a nice quiet ride, so this will definitely be annoying. I *was* an unsuspecting passenger just expecting a quiet ride home from the airport. But after spending 6 hours in an airplane middle seat, this was a real treat to stumble in to a noisy, happy rail party. This was by far the fastest 20 minute train ride I’ve ever taken. Someone broadcast this with their Android, please. I think Zach’s last sentence pretty much sums up ST’s sponsorship. They might have to go pantless to go unnoticed. OMFG this sounds awesome. I’m there. That is SO COOL!!! Never thought ST would allow someone to do this with their precious Link. Is there just a slight chance somebody made a one-month-less-two- days mistake on their calendar? Haven’t got time to check it out now, but does anybody have a phone number on this one? Can I bring my Holstein Cow on board? Or, my pet chipmunks? The cow won’t fit in the elevator at IDS. This sounds pretty cool. If ECCC doesn’t beat the energy out of me, I’ll tag along. So I suppose everyone who attends this event should have ORCA “cards” because if you bought a point to point ticket and didn’t buy a return ticket, the Fare enforcers could make a killing. At 22.5 months in use, shouldn’t most regular (and even irregular) transit users have ORCA by now? ST just posted a photo on facebook – did anyone from the blog go along for the ride? I went down but I took the quiet train back. Dark rail > light rail.